The Arcane Scrolls Mod for Minecraft 1.7.4 is created by the developer ‘duke605’. This mod adds in many different scrolls into the game that act by giving the player a specific ability. There are currently four main types of scroll: Utility, Offensive, Defensive and Special. First of all, you need to download and install the mod. However once you have done this you need to make a scroll, which can be done quite simply. Firstly you need to make an ‘Arcane Tome’ book. Next, you need to research a scroll in the Arcane Tome and then craft it with a blank scroll and at least one quill! The first feature you will encounter when installing this mod is the ‘Arcane Tome’ which can be crafted with an ‘Arcane Stone’. You can gather this type of stone by mining Arcane Ore! 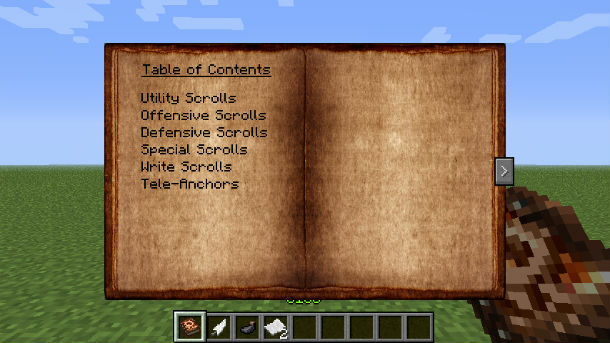 You can then create a scroll by using the Arcane Tome to research, and a blank scroll and quill to immediately craft it! But beware, as the scrolls work on a charge system and are only available for a short time! For example, the scroll of ‘Strength’ increases a players damage for 30 seconds and has 40 charges! First of all, you need to download and install the latest version of Minecraft Forge, you can do so by clicking here. Next, download the Arcane Scrolls Mod and drag and drop the .zip files to your desktop! Then, open the following location: %appdata%/.minecraft/resourcepacks and drag and drop the .zip files here! Then you can load up Minecraft and enjoy your new mod! There are currently no public changelogs for this modification!